Stobs was an ideal site to house a Prisoner of War camp as there were few easy ways out of it for any potential escapees. Surrounded by moorland and a camp full of training British soldiers, only the passing railway, the Waverley line, connecting Edinburgh to Carlisle provided a relatively speedy way out of the area. Numerous escape attempts were made by the Prisoners but none are known to have been successful. Carl Michalski, a German sailor aged 20, escaped from Prisoner of War Internment Camp at Stobs on 5th January. Dark complexion, eyes and hair and with a small black moustache. Wearing a military pattern greatcoat, a brown corduroy jacket and dark trousers. 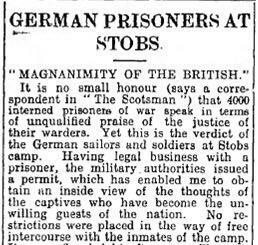 Three Prisoners of war escaped from Stobs Internment Camp on Friday night. All three were originally from sunk German cruiser Gneisenau at the Battle of the Falkland Islands. Two were recaptured at Rutherglen and the other at Spittal by Berwick. His name was Julius Schmidt, who knew the district well having come to Tweed Dock on ships in the wood-carrying trade. He had six shillings and ‘abundant food’ in a ‘strong wooden box’.